Cliven Bundy, anti-government rancher and political theorist extraordinaire, has been releasing videos with even more information on his extremely “unique” view of American — and indeed Western — history and the American social contract. Buzzfeed collected some of the “best of” made-up facts from Bundy’s video. They [the Pilgrims] had a central government, which was Europe. Was the strongest army in the world. And they ruled with unlimited power. And there was a point that they decided they wasn’t going to live that way any more. And so they had a revolution. 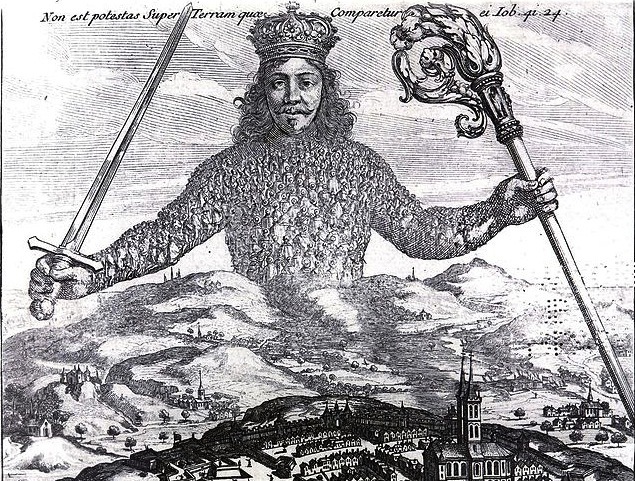 1651 Frontispiece of Thomas Hobbes’ “Leviathan” on the English Civil War and the proper form of government. Tagged alt history, American Revolution, Cliven Bundy, English Revolution, Europe, history, social contract, Thomas Hobbes, United States. American History: A bloody coup in the U.S.